Lately I’ve been feeling a little guilty about neglecting the blog, but this past week I just haven’t felt like baking. I don’t know if it’s because of all of the last-minute baby prep or because Stephen went back to school this week and we’ve been trying to spend as much time together as possible. Either way, I’ve been avoiding the kitchen. Yesterday after I saw him out the door I mustered up the energy and will-power to bake up a breakfasty treat. We had a giant lone peach sitting on our counter that was begging to get used in something other than a smoothie. Since I had both buttermilk and sour cream on hand (a rare occasion in our household) I jumped on the opportunity to make a coffee or crumb cake. 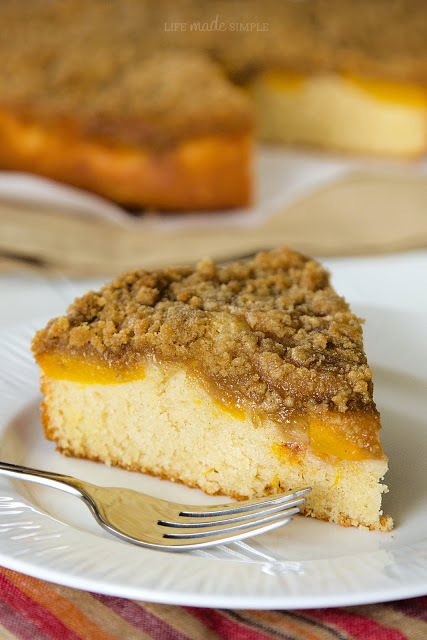 I started off with a light, moist cinnamon cake, topped it with slices of fresh peach, and then covered it with a sweet brown sugar crumble. By the time it had finished baking our entire house smelled heavenly- I was ready to dig in! I let it cool for half an hour before slicing it up, but let me tell you the wait was worth it, because the result was out of this world! Fresh, light and perfectly sweet! 1. Preheat oven to 350 degrees. Lightly spray an 8×8″ baking dish or a 9″ round baking dish, set aside. 2. In the bowl of a stand mixer, beat together butter, sugar and vanilla until light and fluffy, about 2 minutes. Add egg, then egg yolk, mixing until just combined. 3. In a small mixing bowl, whisk together flours, baking powder, salt, and cinnamon. With mixing speed on low, alternate dry ingredients with sour cream and buttermilk (this will help prevent the mixture from curdling). Mix until well combined and no flour pockets remain. The batter will be relatively thick. 4. Remove bowl from stand and spread the batter evenly into the prepared dish. 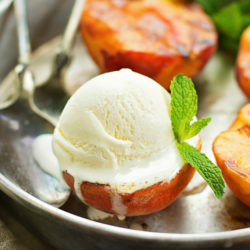 Place the sliced peaches on top, making sure to completely cover the batter. 5. In a small mixing bowl combine all crumb topping ingredients. Using a pastry blender, cut the butter into fine pieces, creating tiny lumps in the mixture. Pour the mixture over the peaches, spread evenly. 6. Place in oven and bake for 35-40 minutes or until a cake tester inserted into the center of the cake comes out clean (I baked mine in a round dish and it took about 38 minutes). The topping should be nice and brown and the center should look slightly moist. Remove from oven and allow to cool for 30-45 minutes before serving. Looks so delicious! I’m going to have to try this one. I must say, your blog is beautiful!! 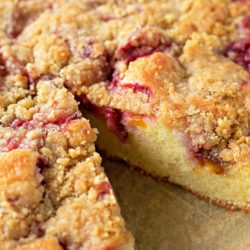 What a delicious looking cake! 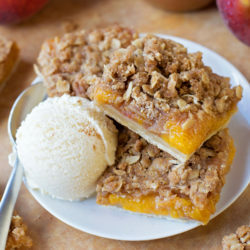 I love different crumb cakes, and it sounds wonderful with peaches! This looks amazing and love that you just whipped it up! I never have buttermilk around, but when I do I try to come up with stuff like this too! Yum. What a lovely cake! Seriously, this is fantastic! Pinning and sharing on social media. Thanks for sharing another one of your great recipes at Marvelous Mondays! Looks absolutely amazing! 🙂 Will be putting this on my to-bake list. Pinning! Next Post » Baby Update: We’re Almost there!